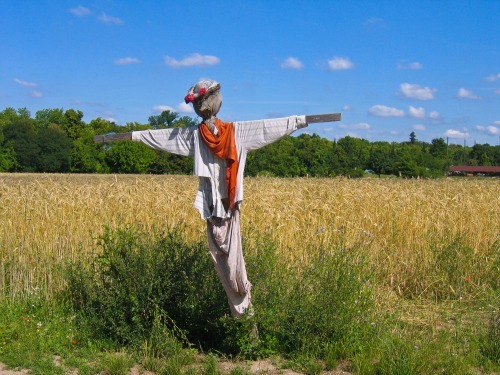 Scarecrows are famous landmarks of our rural heritage. Almost as famous for not scaring birds away as they are fun to make, a scarecrow just *might* really work for the birds. Here at Micro Eco-Farming, we didn't feel complete without at least one quick how-to for making a scarecrow. But they can also work as a customer draw for your farm. Build one and have him hold up a new sign every now and then, such as, "Gee this scarecrow job is boring." Or something more practical like, "Blueberries will be ripe by this weekend." 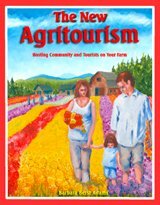 If your farm utilizes agritourism, hold a scarecrow making workshop on the farm, or trade (or embellish) the well-known corn maze or hayrides for a scarecrow museum. Here's one simple way to make a scarecrow: Start the scarecrow by making a cross in similar proportions as a Christian cross. You can use two pieces of bamboo, 2×4s, pvc pipe, etc. Lay the two pieces on the ground in cross pattern and connect them with duct tape at the joint, layering in criss-cross fashion until the joint connection is very strong. Make the scarecrow’s head by stuffing an old pillowcase or by wrapping a yard of burlap around a head-sized ball of packed straw, leaves, rags or sawdust. Use fabric glue to affix eyes, nose and grin cut from felt or scrap fabric, and spray or paint with fabric waterproofing material if desired. Before tying the bottom of the pillow case or burlap shut with raffia (sold in craft stores), place the head over the top of the cross, then affix it in place with the raffia. Put an old denim or plaid shirt (easy to find at second-hand stores) over the “arms” of the cross and button it closed. Affix old gloves to the ends of the shirt sleeves with safety pins. If you don't want to leave the shirt flat, stuff the shirt with old rags and tie the bottom of the shirt to the base of the cross to keep the stuffing inside. Attach the top of old lightweight pants (such as khakis) to the bottom of the front part of the shirt with jumbo safety pins. Hold the scarecrow up by placing the bottom of the base in a five-gallon bucket filled with sand or gravel. This allows a strong person to move the scarecrow around now and then so birds and other wild animals don’t get too used to it. A vest and/or a straw hat or baseball cap are other fun optional additions. The RSS subscribes you to the entire Great Group Activities site, of which the Micro Eco-Farming hubs branch off from.